Important Note: Apart from WSDesk, This demo site includes the demo of our newly launched WSChat. Explore WSChat Settings. The chat widget (WSChat) displayed on the bottom right of this demo site is only for demonstration purpose. No real agents are involved. If you have any questions or clarifications on our products, please contact ELEX support. The WSDesk demo site login displays three credentials each for demo(admin), supervisor, and agent account respectively. The demo account is an admin account which has all the authorities like creating new supervisor or agent profiles, editing their capabilities to access the plugin settings, configuring plugin settings, email settings, backup and restore settings, access tickets, and reports pages. The supervisor account can create agent as well as other supervisor profiles and assign/edit their capabilities. A supervisor has access rights to reply, delete & manage the tickets, manage templates, access plugin settings page, agents page, email page and import page of the plugin. Whereas the agent account enables you to reply, delete and manage the tickets. In addition to this, an agent can access reports page. Agent – An agent/supervisor can create a ticket in the Tickets dashboard. For more detailed information, read ‘Adding a New Ticket’ section under the Tickets settings of the product documentation. Sending a direct email – A customer can send an email directly to the customer support email address (ex. support@example.com). For this, you need to configure IMAP support in the Email settings of the plugin. Customer Support Page – Use our demo support page to raise a ticket. You can configure the input fields in the Ticket Fields section of the plugin settings. For more detailed information, read Ticket Fields section in the product documentation. A screenshot of sample support page is shown on the left. WSDesk comes with a lot of customization options. You can customize Tickets fields, Tickets status, Ticket tags, Ticket views, support form, outgoing emails, email filters and blocking option and lot more! To understanding each feature in detail, read our product documentation. Triggers are a condition-based action that can be used in many ways for ease of business. You can configure instant email notification for your customer tickets and automate ticket assigning. Additionally, you can create triggers for sending a reminder of a long-pending ticket to the support agent, pending tickets to be marked resolved after a certain time period, tickets differentiation based on source, handling priority tickets and so on. Read five awesome things WSDesk Automation can do for comprehensive understanding. For more detailed information, read Triggers and Automation section in the product documentation. With WSDesk Triggers and Automation feature, you can create customer satisfaction surveys in simple steps. This satisfaction surveys will be helpful in getting customer feedback for your product/service and in turn, will allow you to analyze your support performance. For example, you can create a trigger that sends customer satisfaction review email to customers, when an issue is resolved and the ticket status is marked closed. For more information, read how to set up Customer Satisfaction surveys & emails in WSDesk? A screenshot of sample Customer Satisfaction page is shown on the right. WSDesk makes use of a few aspects of your WooCommerce store for integration, which includes products, categories, tags, order details and order prices. 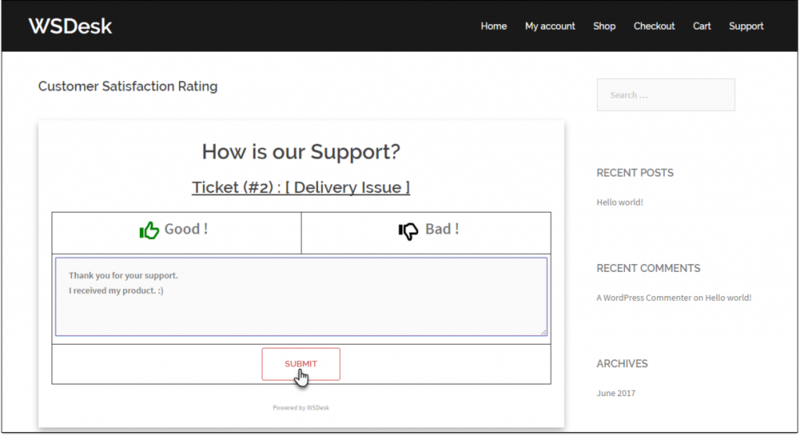 In this way, your WooCommerce customers can easily raise issues with your products from the support page. For more detailed information, read WooCommerce Integration section in the product documentation. Reports page helps you analyze your WSDesk data. You can monitor your WSDesk ticket status, agent responses based on date filters. If you have integrated WooCommerce, you can view custom WooCommerce reports that show tickets status of your top products and top product categories. A screenshot of Agents reports is shown on the right. For more information, read Reports section in the product documentation. With WSDesk Backup and Restore settings, you can take a backup of WSDesk settings and/or tickets data of a specific time period, in an XML file. Similarly, you can restore the date from an XML file in simple steps. In addition to this, you can restore the deleted tickets from the trash and set up custom starting number to initiate the tickets. For more detailed information, read Backup and Restore section in the product documentation. WSDesk is much more than your usual WordPress helpdesk plugin. Create triggers and automation for various use cases. 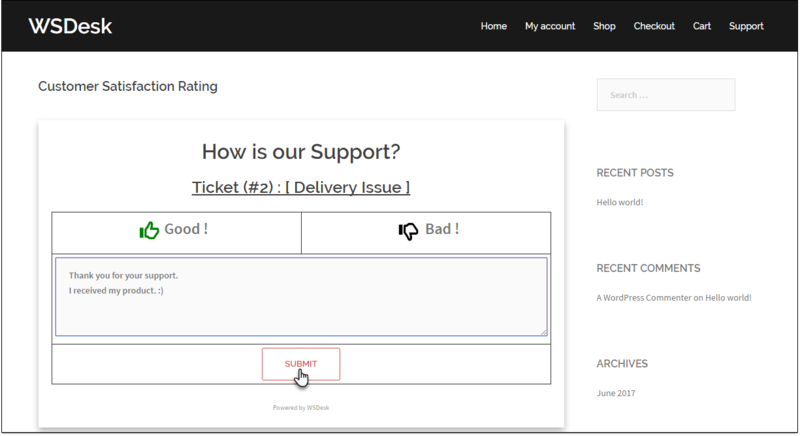 Customize the support form with Ticket fields. Use Autosuggestion feature while raising a ticket or replying to the tickets. Create unlimited agents and supervisor profiles. Create custom ticket submission form. Get a quick view of tickets and quick reply. Create Customer satisfaction review page. Integrate with WooCommerce multi-vendor plugins. Make WSDesk work with Multisite. Use WSDesk create ticket API with third-party forms and plugins. Take advantage of WPML Support. Also, read Top WSDesk Features that make it The Best WordPress HelpDesk System and 3 Unnoticed Features of WSDesk. To understand each feature in detail, read our product documentation. Or check out WSDesk FAQ article. You can also explore the blog archive to understand how WSDesk can provide ease to your business. With the help of our Agent Signature Add-On, you can add a professional signature to your agent and supervisor profiles. The signature can be added in HTML format, which means, you can add external links and images as well. You can find the add-on setting in the respective WordPress User Profile page, under WSDesk Agent Signature Add-On section. With our SMS Notification Add-On, you can send SMS notifications to Customers, Agents, and Ticket Assignees. You need to create WSDesk triggers to send SMS notifications. Watch Video for a brief demonstration of this Add-On.